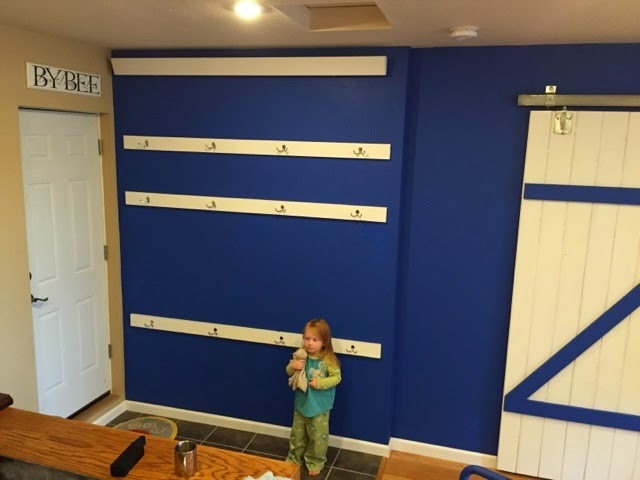 Over the course of a few weekends, we tackled another little project out the in the playroom. We started on the 4th of October, and finished up on the 26th...definitely not moving quickly on our projects right now! In our destruction of the front hallway, we tore out our coat hooks, leaving big piles of coats and hats all over the house. 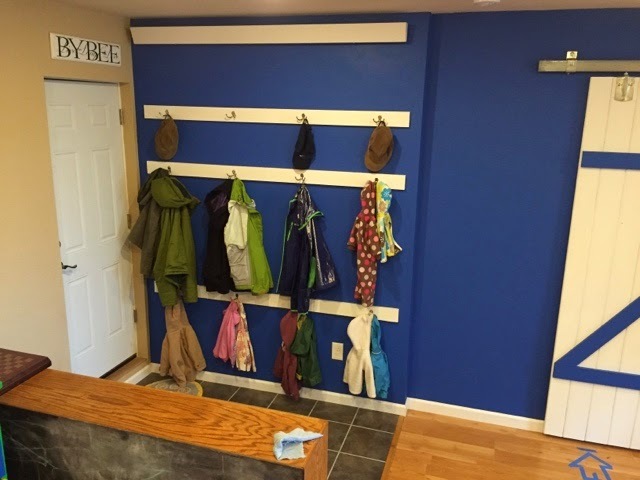 I had always intended to hang coats by the door to the garage in the playroom, but the mess around the house definitely sped up the project. We wanted something clean looking, and something sturdy enough that the hooks won't rip out of the wall. Once we got the idea figured out, it really wasn't too hard to implement. We (I!) cut three 1x4s and then painted them white to match the trim in the playroom. Then Andrew hung them to my specifications. I did some careful measuring to space out the three rows so that hats hung nicely on the top rack, adult coats on the middle, and kid coats on the bottom. I wanted the coats to overhang as little as possible. I found these great simple silver hooks, two-pronged, so we could hang more coats. The hooks say they are 6$ a piece now...don't pay that much for them. When I bought them they were less than 2$ each! Before Andrew hung them, we played around a bit to figure out how to evenly space them and get as many hooks in as possible, without all of the coats bunching up. We ended up with 4 hooks (8 spaces to hang) in each row. After getting everything hung, Andrew went back with wood filler to fill in over the screws in the boards and then then we touched it up with white paint. The touching up is the part that took us a few weekends. The end result is a clean, crisp coat hanging system, with firmly secured hooks that won't rip out of the drywall. I love finished product! Me cutting boards, my first time!